* Hamster protected the squares of 5c, 4c and 3c. *P-6f closed your Bishop's diagonal line. This pawn advancement is to trap Hamster in the future. Hamster opened his Bishop's diagonal line to take it. * You opened your Bishop diagonal line but it's blocked your pawn on 6f advanced previously. Hamster's P-8d is a natural move to activate his one of major pieces such as Rook. * Your N-7g lured Hamster to take the Pawn on 6f. Hamster took it. * Your plan was to use the Rook vertically. Hamster took the Pawn on 5g with promotion. * Your Rook got promoted with taking a pawn on 6c in return for Hamster's Bishop promotion. Hamster took a pawn on 4g to take the kNight on 2i in the next move. * Your Rx6a threatened Hamster to take his Silver on 7a which was floating. 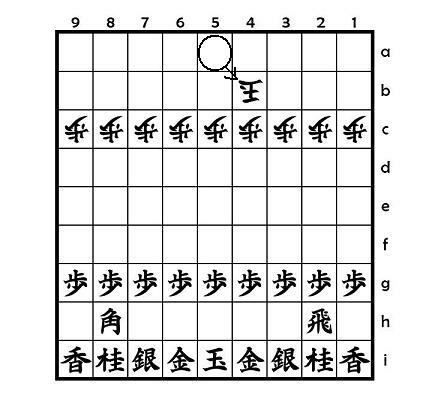 Aiming at a floating piece is one of the basic tactics in shogi. Hamster's S-7b avoided being captured and threatened you back to take your promoted Rook. You had to move it to somewhere. To which square would be good? * Your +R-7a avoided being captured by Hamster's Silver on 7b and threatened him to take his Rook on 8b at the same time to keep initiative. 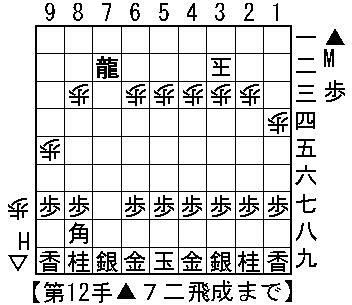 Keeping initiative is very important in the endgame in Shogi. Hamster had to pull his Promoted Bishop to 8c to connect with both his Rook and Silver. * Your N-6e had two meanings such as giving threat on the square of 5c which was near Hamster's King and offering Bishop exchange. Hamster denied Bishop trade by N-3c. But it was his blunder. * You took Hamster's Rook by your Rook. Hamster took it back. This was an even trade and you kept your initiative to make a next move after the trade. * Your Bishop got promoted in check with taking a pawn. Hamster's King went back to its original position. * +R-6b was a move of checking Hamster's King. Hamster did not drop a pawn on 5b due to illegal move of double pawn. Then he had to pull back his King to 4a. * You had a choice to take the Pawn on 5c by your kNight whether getting promoted or unpromoted. The right move was with unpromotion to checkmate the King. * Your plan of using Rook horizontally was revealed. Hamster's bishop got promoted with taking a pawn on 5g. * B-9g made you have numerical advantage on 5c with your Promoted Rook and Bishop. Hamster added his Rook's line to 5c to protect it. * P*5d was a very good pawn drop to utilize your Bishop's diagonal line. Hamster could not take it since his King would be exposed in check. Hamster gave up defending the square of 5c and took the kNight on 2i. * You dropped a Rook in hand to check Hamster's King supported by your promoted Bishop on 5c. * Your Rook got promoted to checkmate Hamster's King supported by your Promoted Bishop on 5c. You could beat Hamster to use only your Rook, Bishop and pawns in 4pc handicap. It's important to learn how to activate your major pieces such as Rook and Bishop. Here is the one beting Hamster in 10 piece handicap. 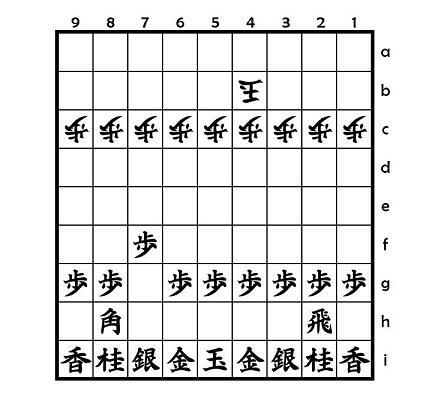 *The first move of K-4b is protecting the square of 3c preparing for your opening Bishop's diagonal line. *You opened your Bishop's diagonal line. Please confirm it goes to the square of 3c. *Second, you advanced Rook pawn. 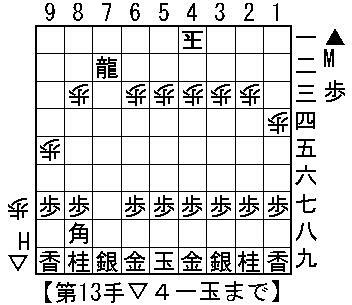 In shogi, Rook and Bishop are called Ohgoma(Major pieces). It is generally important to activate these major pieces to win a game. *You advanced your Rook's pawn again to make it possible to float to 2f. *You moved your Rook from 2h to 2f. The aim is to slide it to 3f to attack the square of 3c with two major pieces such as your Rook and Bisohp. 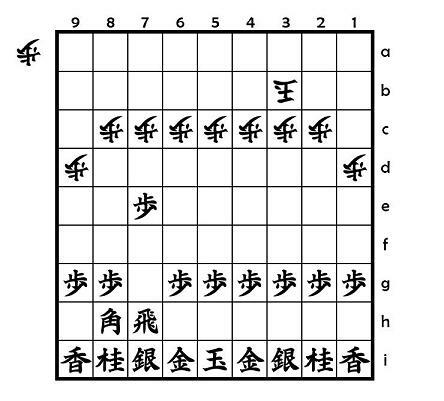 *Please confirm that the 2pieces such as your Bishop and Rook can go to the square of 3c while it is protected by only one piece such as your opponent's King. You have numerical advantage on the square of 3c. *Your Rook took the pawn on 3c with getting promoted. It's also check. Since the Bishop on 8h supports the promoted Rook, then the King cannot take it. *Checkmate. The king cannot take the promoted Rook since the Bishop on 8h still supports it. 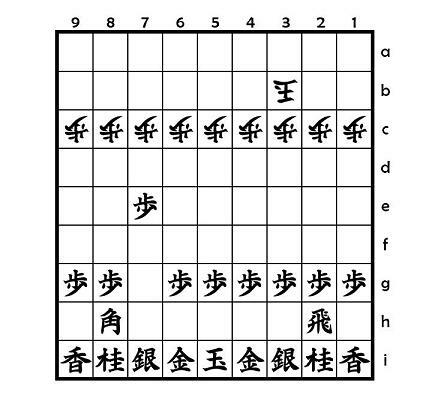 Recently I found many Hamshogi Walkthrough Videos on Youtube. Here is the one beting Hamster in Naked King handicap. This is the line from the start to the end with my comments. *You advanced the left edge pawn. This is the preparation of moving your Bishop from 8h to 9g. *Please confirm your Bishop goes to 3a now. The opponent's King is suddenly in danger. *You advanced your Rook's pawn. 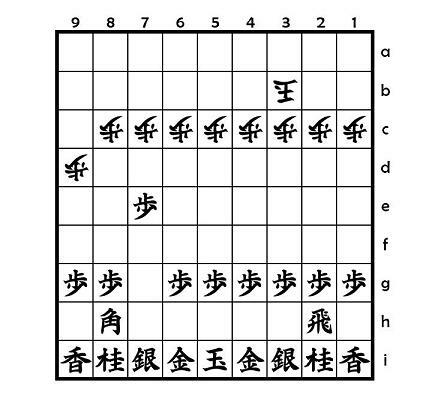 It's generally importatnt to activate your Rook and Bishop well in shogi. Both are called Major Pieces. *You advanced your Rook's pawn again. The pawn is supported by your Rook. *You advanced your Rook's pawn third time. 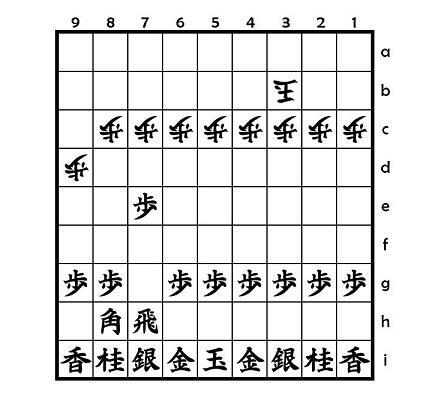 The pawn advancement supported by Rook is one of the basic tactics in shogi. *Your Pawn got promoted on 2c. The promoted pawn can move to 7 squares as a Gold does while unpromoted one can move to one. In other words, a promoted pawn is as seven times capable as an unpromoted pawn. 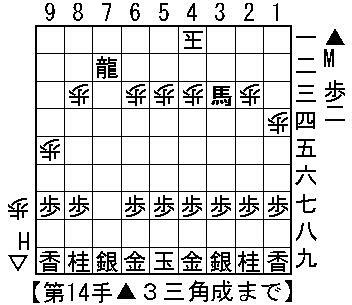 Making promoted pawn is one of the basic tactics in shogi. *Checkmate. The promoted pawn is supported by your Rook on 2h. So the King cannot take it. 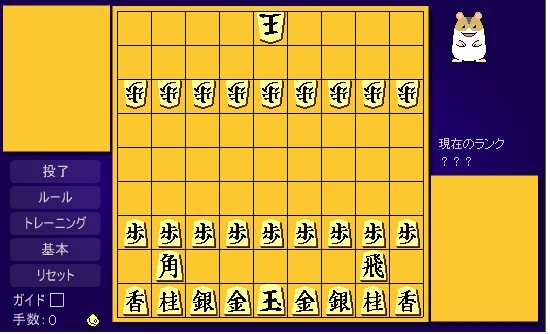 Here is the board for replaying the game move by move. The diagram above shows Hamster moves his Pawn from 9d-9e, which intends to avoid being captured by my Rook. But my intention is not to take the pawn. What do you think is my nex move which is one of the key moves in this game? My next move is R7d-7b. The Rook gets promoted with checking Hamster's King horizontally. The diagram above shows the position at 12th move where my Rook get promoted to 7b. My promoted Rook works both horizontally and vertically well. Please look at the pieces in Hamster's hand. There is a Pawn in his hand. He wants to drop a pawn on 4b in the 13th move but it's prohibited since it's an illegal move of double pawns on a file. So Hamster's King has to move away from my promoted Rook's horizontal line. What do you think is Hamster's next move? The answer is K-4a shown in the diagram below. The diagram above shows that Hamster moves his King from 3b to 4a to avoid my promoted Rook's horizontal line. My Rook already is promoted. Now it's time for my Bishop to get promoted since the pawn on 3c is isolated since Hamster's King moved down to 4a due to my promoted Rook. What do you think is my next move? The answer is B8hx3c+ taking the pawn on 3c with getting promoted shown in the diagram below. Due to the empowered Rook and Bishop, Hamster's King cannot move except to 3a. The 2nd row is dominated by my promoted Rook on 7b and the square of 5a is controlled by my promoted Bishop on 3c. So, Hamster is quite at a loss to make next move but he finally drop his pawn on 3a at the 15th move. Please see the diagram below. What's my next move? My Bishop and Rook already got promoted. It's time to mate Hamster's King to activate these powerful pieces together. What is the square where my promoted Bishop's diagonal line to 5a and my promoted Rook's horizontal line cross? They cross at 4b. The square of 4b is in front of Hamster's King and my two pieces cross. What's do you think is my next move to mate Hamster's King. The answer is shown in the diagram below. The answer is +R7b-4b. Moving the Promoted Rook to the crossing square of 4b mates Hamster's King since he cannot take it supported by my promoted Bishop on 3c. You can mate by +B3c-4b instead of +R7b-4b as well. As you see in the above, activating promoted Rook and Bishop together is the key to mate Hamster's King. Here is the directions again I wrote at first. Open your Bishop's diagonal line as your first move. Taking vanguard position by advancing the Pawn twice on 7th or 1st file. Transfer your Rook to the file where you took vanguard position. Trade your Rook's pawn to let your Rook advance and get promoted then. Make a check with promoted Rook. After that, let your Bishop get promoted. Mate Hamster's King by using two promoted major pieces such as Rook and Bishop. And, here is another line to beat Hamster in this handicap by breaking through the 1st file for your reference. Please confirm this line also follows the directions above. This is the end of Hamster Walkthrough - 10 piece handicap. 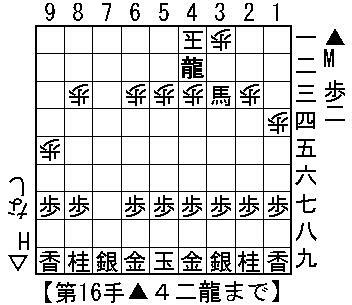 The diagram above is the position that I moved my pawn on the 7th file from 7f to 7e. 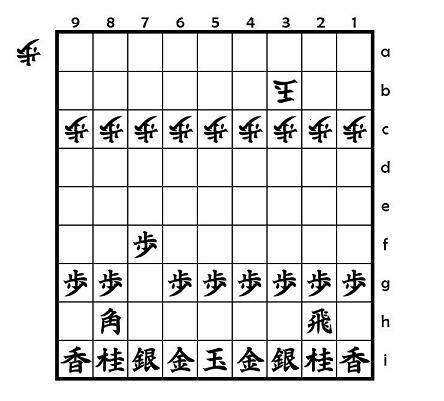 Different from FIDE chess, shogi's pawn can't advance two squares at once when it moves first. So it takes two moves to take vanguard position on a specific file. Taking vanguard position on a specific file means advancing your pawn twice to occupy a square of the e-row on a specific file while the opponent's pawn stay on its original square of the file of g-or-c-row. Please see the 7th file of the Diagram#4, my pawn advanced to 7e while Hamster's pawn still stayed on 7c. It's called I took vanguard position on the 7th file. My aim is to transfer Rook to 7h of the 7th file from 2h which will give it two free squares(7f and 7e) to move forward and trade pawns on 7d by Rook in my following move. 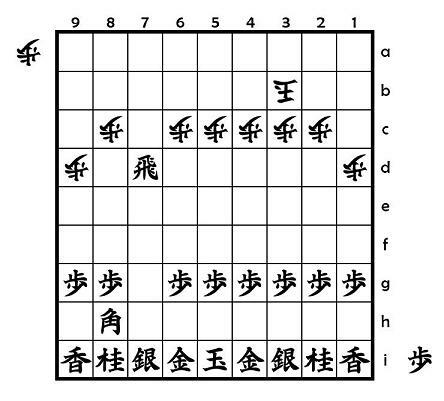 Hamster advanced the left edge pawn in the diagram from 9c to 9d. Its intention is to prevent me from developing Bishop to 9e by way of 7g using two moves. What do you think I made a move next? The answer is R2h-7h, transferring Rook from 2nd file to 7th file. When the Rook was located on 2h, it could move horizontally only since my Pawn on 2g and kNight on 2i disabled it to move vertically. Now, my Rook on 7h can move both horizontally and vertically. It apparently functions better on 7h than on 2h. The aim of the Rook's transfer to the 7th file is to trade the Rook's pawns on 7d to break through Hamster's defensive horizontal line of the pawns on c-row. Please remember Hamster's King cannot come to defend the 7th file since my Bishop's diagonal line has gone through the square of 3c since the 2nd move. My attacking formation is ready now which means the end of the Opening. My next move will be the start of the middlegame. Hamster advanced the right edge file in the diagram from 1c to 1d. The intention of this move is not so positive. Actually he has no effective pieces to move in this big handicapped game. Anyway, Hamster keeps the horizontal defensive line of the pawns on c-row. What do you think I made a move next to break though the defensive line? The answer is advancing my Pawn from 7e to 7d just in front of Hamster's pawn on 7c. Both pawns faces each other on the 7th file now. My pawn on 7d is to be captured by Hamster's next move of Px7d. Is that ok? Anything wrong with my attack? Don't worry. Right after Hamster takes my Pawn on 7d by Px7d, I can take it back by the Rook such as Rx7d. 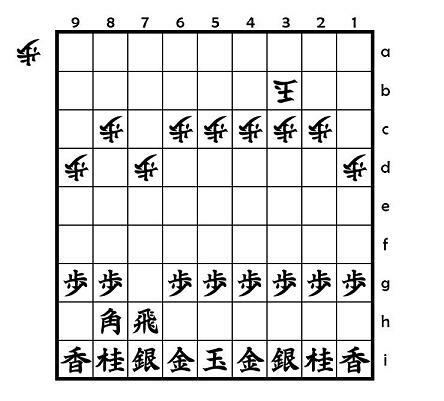 Please remember, in shogi, the middlegame almost always starts by facing both pawns each other on a file like this. The intention of P7e-7d is to trading the Pawns on the 7th file to advance my Rook to work better. What do you think Hamster did in the next move? The answer is Hamster's P7cx7d. Hamster had to take my pawn. Otherwise, he would have lost a Pawn by Px7c+ in my next move. Now, I lost a pawn first on the 7th file. What do you think I did in the next move? The answer is my R7hx7d, taking back the pawn on 7d. It's a natural move to take back a pawn after you lose a pawn. Let's look back at the recent moves. I offered Hamster to take my pawn at the 8th move, and then Hamster took the Pawn by his Pawn at the 9th move, after that, I captured back his Pawn on 7d by my Rook at the 10th move. Both sides have a Pawn in hand during this sequence from the 8th to 10th move. 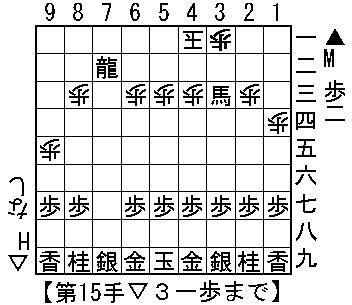 We call the sequence "Hisha ni Yoru Fu no Kokan(Pawn exchange by Rook)." Pawn exchange by Rook is almost always a good trade in the opening and the middlegame. So when it is possible, do not forget to do that. Please watch the diagram #10 carefully to count how many squares my Rook on 7d can go horizontally and vertically and compare them with that at the original position. Now, my Rook can go to 8 squares horizontally and 7 ones vertically. And Hamster has no measure to prevent my Rook from invading his camp. It works better and better through the process of Pawn exchange by Rook. Please look at the board above carefully. Comparing with Naked-King handicap, nine pawns are added to Hamster's side. What does it mean? It means Hamstar's defensive capability is slightly empowered. You can still beat Hamster with moving only three kinds of pieces such as Rook, Bishop and Pawn. You do not have to move the other pieces such as King, Gold, Silver, kNight and Lance. Here are the directions about how to beat Hamster when you are a 10 piece handicap taker. Let's play a 10 piece handicap game against Hamster in accordance with the directions above. I will write an commentary using my games with Hamster with lots af diagrams tomorrow or on a later day.